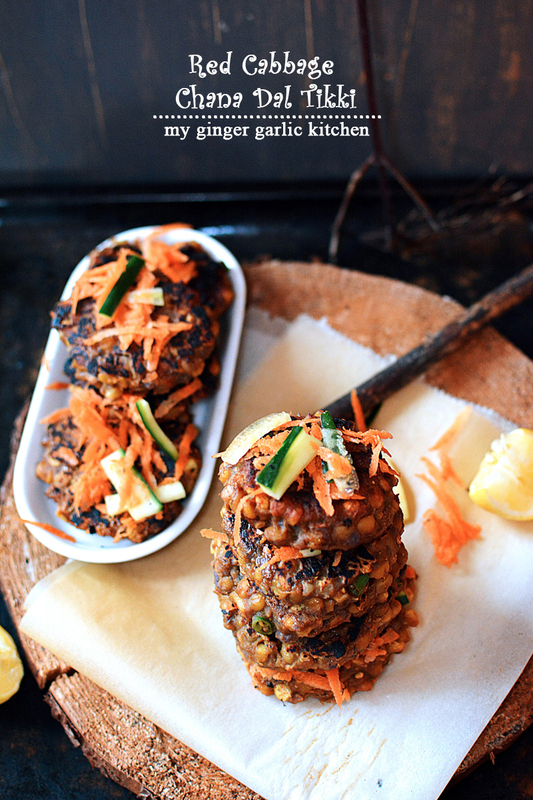 Chana Dal Cabbage Tikki is a healthy and delicious tea-time Indian snack which can also be served as an appetizer or a brunch. 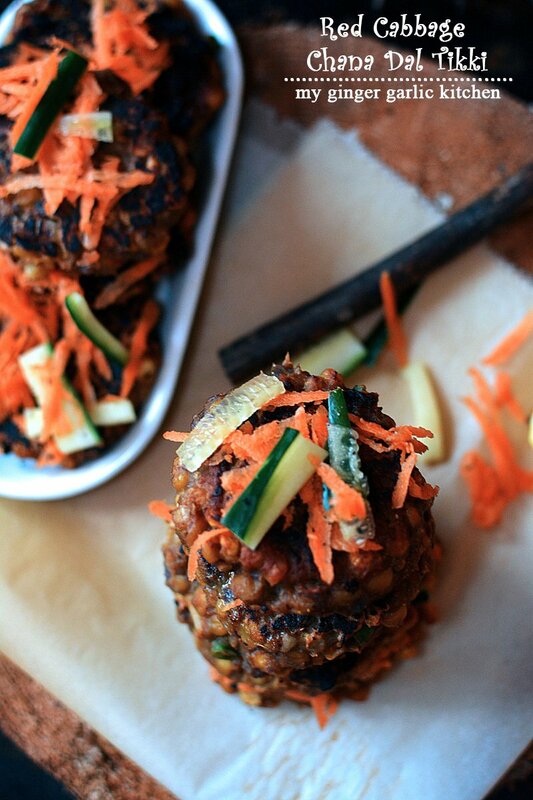 These hearty and wholesome Chana Dal Cabbage Tikkis are beautifully flavored with spices. These tikkis are roasted in very little oil. Hence, they are very light on your stomach. This is a weekday, and a day in this HOLIDAY season too. So we can easily say — it is still a long weekend. Life is just wonderfully blissful around here!!! When I see outside, everyone seems to be so happy, and looks like they are still in the mood of celebration. Well! Why not — this should be the spirit. A wonderful year is going to end and a brand new beginning is round the corner. I say that is the good news. That is the reason to celebrate. If you talk about my Christmas, it was indeed so much FUN. A deadly hectic time, yet enjoyed so much! It was time to relax on the Christmas Eve night after a long hectic time, when everyone sits on the same table. Family! Food! Unlimited FUN! So the question here is — cleansing of what??? Cleansing of BODY from inside. My body was screaming out loud from inside to get some light and nutritious food, which would bring some gutful energy to me — an energy of spectacular fulfillment. So I got started with this, and decided to make something fibrous yesterday. Let me tell you more about my wondrous cooking adventure yesterday. 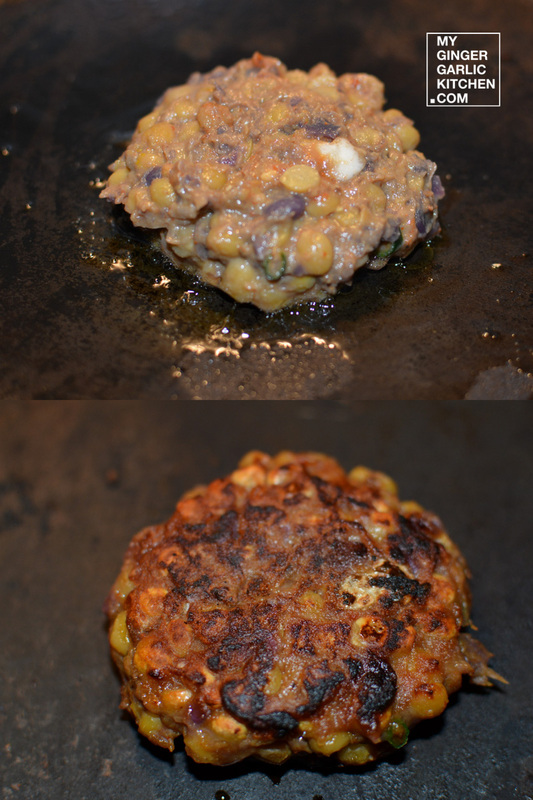 I made Chana Dal Red Cabbage Tikki. 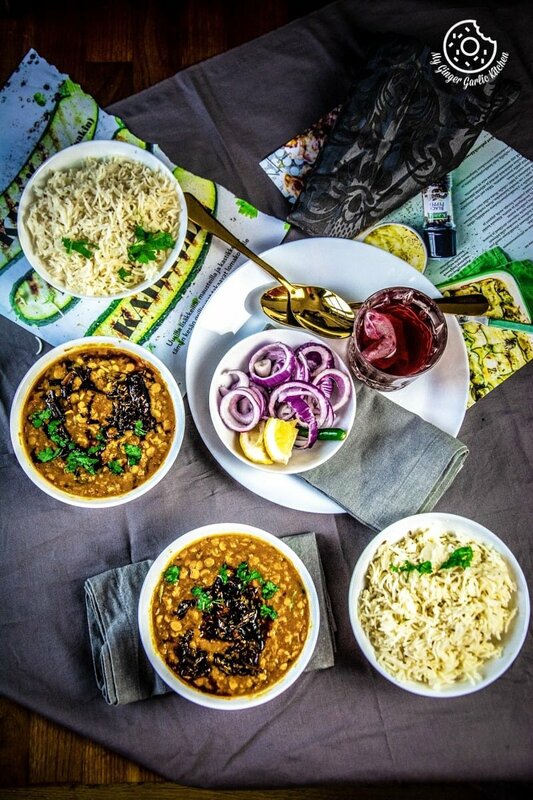 I had some red cabbage in my fridge, and I used that along with split bengal gram (Chana Dal), some chopped onions, some freshly chopped green chilies. For finishing touch, I added some chickpea flour, which also helped in binding the tikkis. The mixture smelled really INCREDIBLE, with all the aroma of spices and freshly grated garlic. And of course I squeezed fresh lemon juice on top after cooking, which was indeed an icing on the cake. OH! And it was a Jaw-dropping presentation with fresh salad. The resulting taste was mind-blowing! 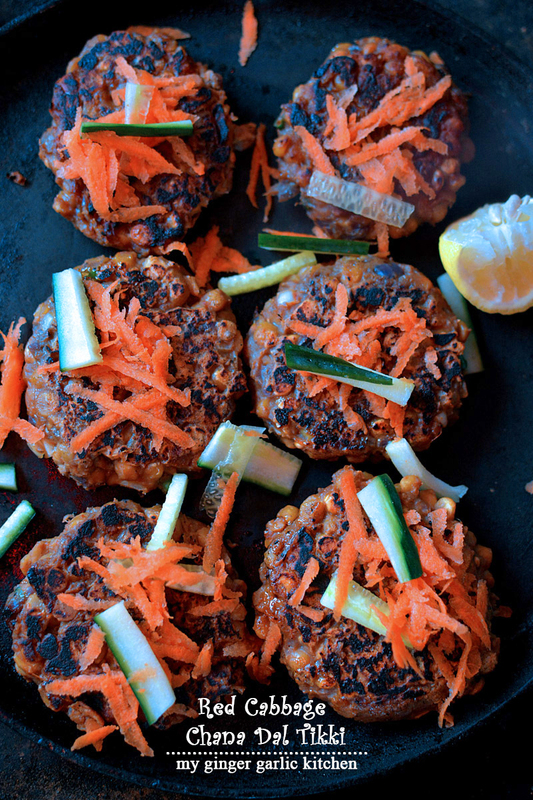 These delicious tikkis were cooked in a pan, and the result was a simple and easy dish. You simply cook it covered over medium-low heat, or you can simply bake it in the oven. I personally prefer the pan roasting as I just think the tikkis come up with a more distinct flavour. That’s it. I would highly recommend these tikkis with mustard mayonnaise. Can I serve this tikki to a diabetic person? 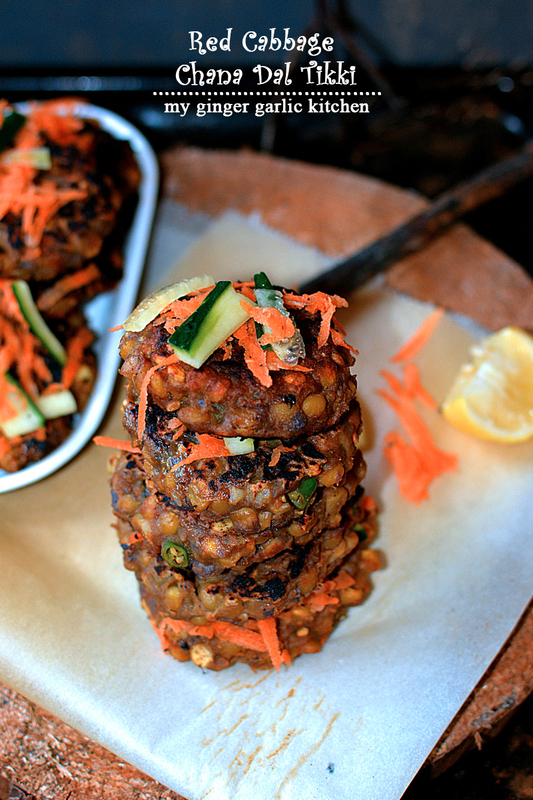 Yes, these splendidly flavored healthy tikkis are Diabetic friendly because of the addition of cabbage and chana dal. Thus, these can be served to a diabetic person. The crispness of chana dal and cabbage combined with chickpea flour and spices seasoning create magic here. These tikkis have a perfect texture — crisp from outside and soft and chewy from inside. 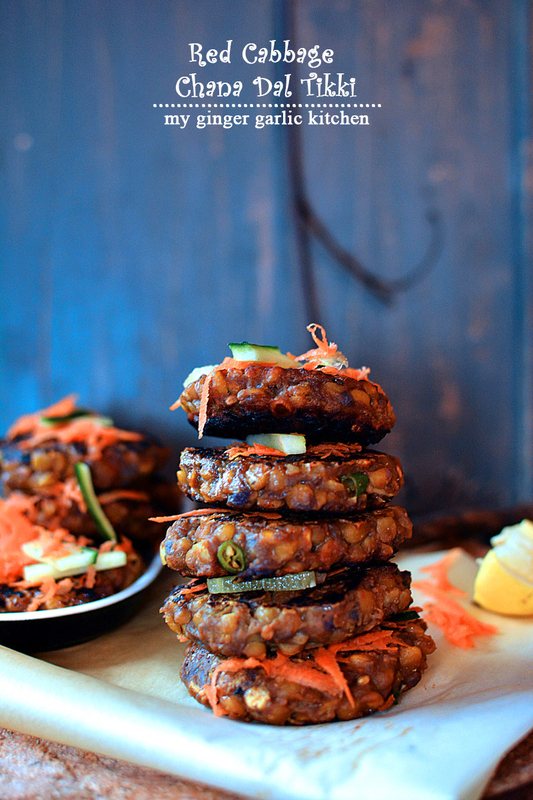 How to bake Chana Dal Cabbage Tikkis? For baking tikkis, arrange tikkis on a lined baking tray. Brush them with some oil. Bake in 175°C pre-heated oven for 20-25 minutes or until they are golden and crisp. Don't make this tikkis mixture in advance, and always shape these tikkis, when you want cook. Grease your palms, if it hard to shape the tikkis. 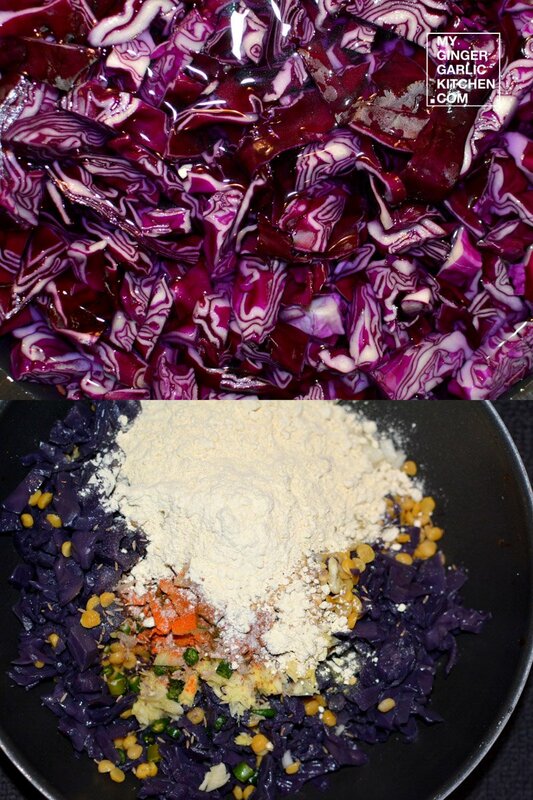 I have used purple cabbage, but you can also use regular cabbage for this recipe. Boil 2 cups water in a pan. Add cabbage to it and boil it for 7-8 minutes. Let it cool completely. Drain it and set is aside. (Don’t discard the nutritious water, you can use this water for making chapati dough). Add all the tikki mixture ingredients to a mixing bowl. Mix everything well and divide into 8-10 lemon sized balls. Press each ball slightly to shape into tikkis (flattened balls). Heat a non-stick pan over medium heat and grease it with some oil. Place shaped tikkis on the pan, and drizzle with some oil. Cook all tikkis covered with a lid from both sides till they turn golden brown in color. Serve hot with your favorite ketchup, chutney and salad. Enjoy! 1. Boil 2 cups water in a pan. Add cabbage to it and boil it for 7-8 minutes. 2. Let it cool completely. Drain it and set is aside. (Don't discard the nutritious water, you can use this water for making chapati dough). 3. Add all the tikki mixture ingredients to a mixing bowl. 4. Mix everything well and divide into 8-10 lemon sized balls. Press each ball slightly to shape into tikkis (flattened balls). 5. Heat a non-stick pan over medium heat and grease it with some oil. 6. Place shaped tikkis on the pan, and drizzle with some oil. 7. Cook all tikkis covered with a lid from both sides till they turn golden brown in color. 8. Serve hot with your favorite ketchup, chutney and salad. Enjoy!